Graham Greene published his novel Brighton Rock in 1938 and over the years he categorized it as one of his “entertainments.” Nobody should fall for that coyness. The novel is dipped in cruelty, wrapped up in bogus debates over faith and guilt (the Roman kind), and it is about as entertaining as being trapped in a corner by a cobra and feeling you must stare it down to avoid the venomous strike. The novel was filmed in England in 1947, with a twenty-four-year-old Richard Attenborough giving one of the best performances of his life as the monstrous Pinkie Brown. But now the novel has been re-made and shifted to 1964, when Brighton and the genteel south coast of England was beset by riots (tame by today’s standards) between Mods and Rockers. The former were middle-class and educated; they wore hip clothes and rode motor scooters. The latter preferred motor bikes and dressed like Marlon Brando in The Wild One. It was a foolish moment, and it has nothing at all to do with the new film—but this film is full of things that have too little point or impact. Pinkie Brown is supposed to be seventeen and, as we meet him in the book, he has “a shabby smart suit, the cloth too thin for much wear, a face of starved intensity, a kind of hideous and unnatural pride.” He is pathologically naïve or empty but he overawes grown men in the Brighton underworld because of his baby-faced danger, his malice, and his way with a razor—not that he yet needs to shave too often. One reason why Attenborough was so good in the part is his realization that Pinkie spread terror because he was himself so afraid. 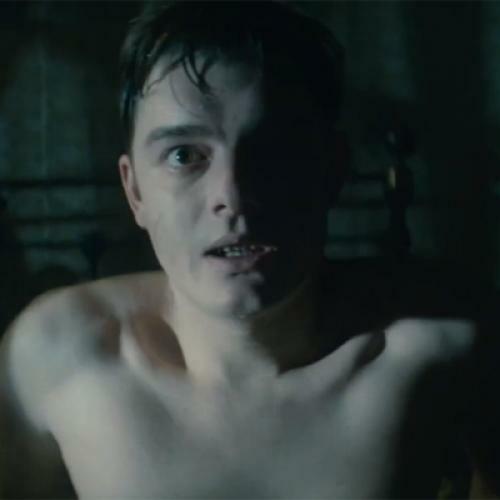 Sam Riley plays the part now. Riley is a good actor, as we know from his Ian Curtis in Control, but he was thirty when he played Pinkie, and he is far from starved. He has an inner command, so he has to work to be nasty. In other words, he seems like a self-conscious thug instead of a dangerous demon. That leaves him too smart to believe in Greene’s fanciful plot—that Pinkie, having killed another thug, needs to make up to the demure and nearly retarded waitress, Rose, to make sure she won’t talk. So he persuades the numb girl that Pinkie and Rose are made for each other, and Rose becomes the story’s idiot. I daresay in Brighton in 1938 there were girls as unworldly as Rose; but not in 1964, and much less now. So the “romance” seems contrived, and if that doesn’t work then the picture has nothing left but spite and Brighton itself. The 1947 film, directed by John Boulting, in black-and-white, did its best at catching that atmosphere, and part of the shock in that first version was to feel the underside of a holiday place regarded fondly by the British. The new film is drab in color, with very little of Brighton—they shot in neighboring Eastbourne, apparently because Brighton is too posh now to be its old self. But nothing hides the way, in 1964, this Pinkie seems headed not so much to hell as to London, where he might open a boutique for the girls in mini-skirts. Part of the large social point of the 1960s in England was that wasted young lives were about to come into power and money. Maybe Pinkie could lead a band. But there’s worse to admit and it has to do with the storyline. For the 1947 film, the script job was entrusted to Terrence Rattigan (the most esteemed London playwright of the day). But his version didn’t work and Greene himself was persuaded to try it—that or he pushed his way in (Greene was crazy about movies). So it was the novelist himself who abandoned his own last line—one of the more merciless conclusions in English literature—and invented a piece of nonsense about a stuck record. I won’t say more to protect those of you still hanging on the story. But that ending has prompted groans for over sixty years. Yet now, director Rowan Joffe reproduces it in exact detail as if he had just thought of it and audiences may go home more tired and depressed than those day-trippers coming back from Brighton in the dark with sunburn on their faces, no money in their pockets, and salt still on their lips. The music is awful: It tries to suggest that Brighton is a place beset with storms. The supporting cast—Helen Mirren, John Hurt, Phil Davis, and Andy Serkis—is illustrious, but they are playing by the numbers. As the mobster chief, Colleoni, Serkis looks as if he’s doing a first reading, let alone a first take. No one seems to believe in the film or the construction of Catholic guilt that felt like a badly-applied bandage—more a necktie than a help—even in 1938. Anyone interested after seeing this film should go straight to the 1947 original and the uncanny way in which the steadily decent and amiable Attenborough was so scary. That’s why, when that movie came to America, it was re-titled “Young Scarface.” Today, the scar is a make-up strip with its own continuity problems.